Since my visit with my brothers in Houston last weekend, I have felt physically out of sorts. Knackered really. Not quite sure why. Time difference? Uncomfortable plane travel? Disrupted sleep? Middle-aged decrepitude?! Probably all of the above! So it’s been a slower week for me. I haven’t visited one thrift store. Or estate sale. Or garage sale. Not one this whole week! I even decided to forgo my favorite bi-weekly rummage sale as, shamefully, I hadn’t listed one thing from what I bought the last time I went. 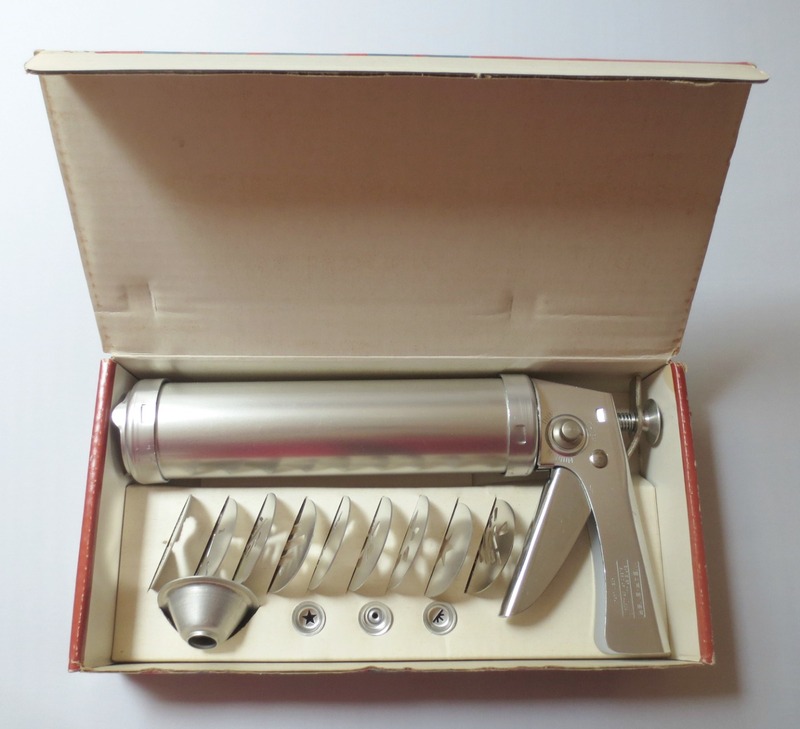 Like this vintage cookie gun/press. The box is a bit beat up, but the press has never been used! Ready for holiday baking. 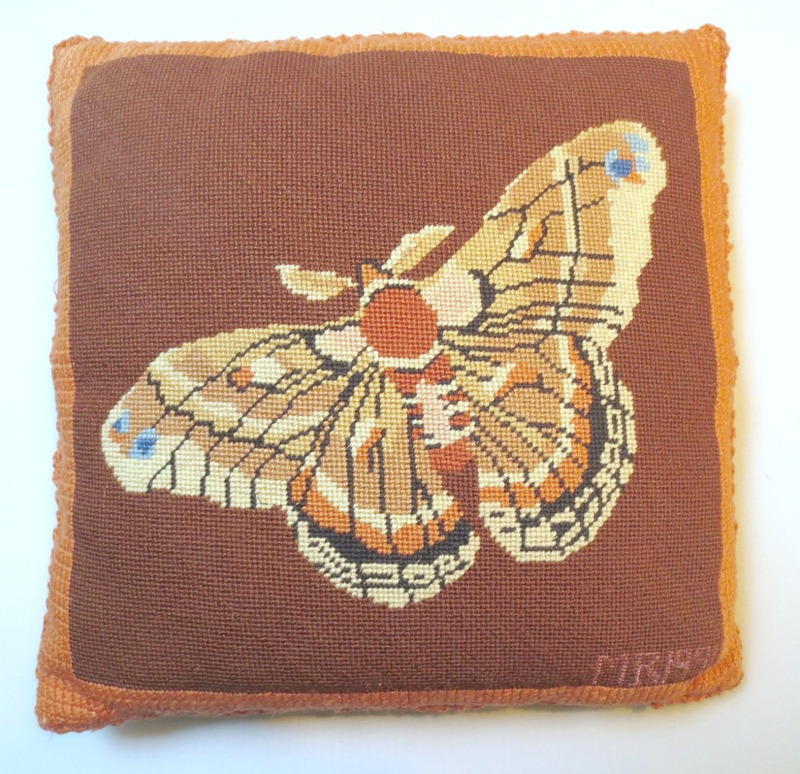 And this handmade needlepoint butterfly pillow. It’s dated 1991, but the colors scream 1970s to me. This would really pop against a black leather couch. 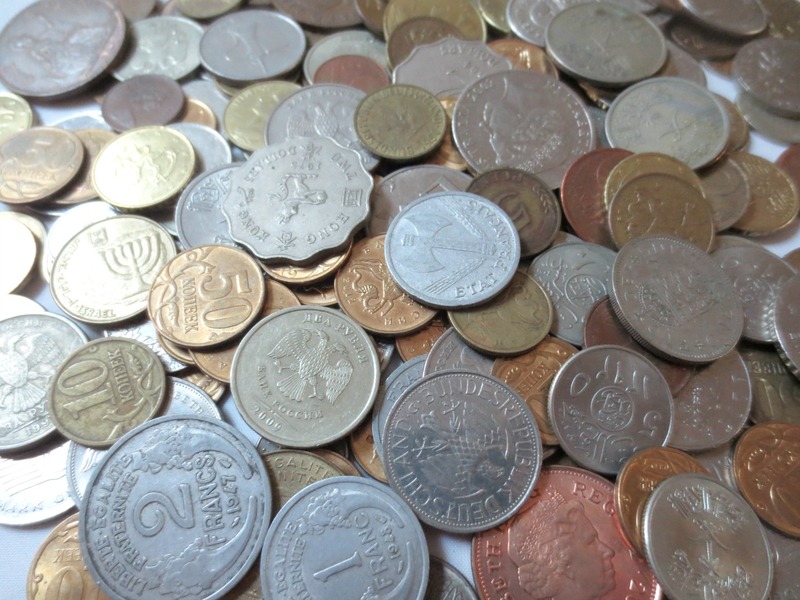 And a good (but heavy) stocking stuffer for a crafter or budding numismatist is this lot of 190+ foreign coins. They include Russia, Saudi Arabia, France, Israel, Australia and Hong Kong. 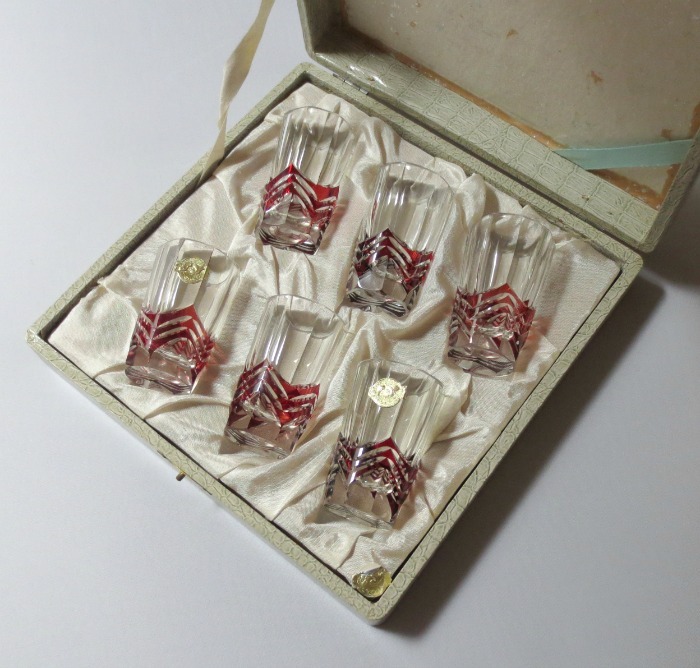 And I listed the beautiful Japanese cut glass shot glasses that I got at the Buddhist Temple rummage sale a few weeks ago. A part of me wishes I had the kind of lifestyle where I could put these to good use! Next up I’ll start listing the jewelry and jackets that are piled up in my office! For you early holiday shoppers, from now through the end of November you can use the coupon code HOLIDAY10 at checkout for a 10% discount on purchases $24.99 and over in my Esty store Lion and Lamb Vintage. Well it’s almost Thanksgiving here in the U.S. and I am thankful for so much. In fact it rather hit me when the SuperShuttle van dropped me off from the airport after visiting my brothers. There was my sweet neighbor Annie in her front yard. We waved and shared greetings and I realized how lucky we were to have such nice neighbors. And there was my little cottage garden and my sturdy little house and I was grateful for both. And inside the house my oldest daughter was eating lunch. And it was so good to see her after a few days apart. And my youngest daughter (who’s in university) called me and it was so good to hear her voice. And it rather gobsmacked me that I have a good life. So many blessings. So much to be thankful for. And I am. How about you? What you are thankful for? I agree on all the thankful things you listed. Family is always my #1. 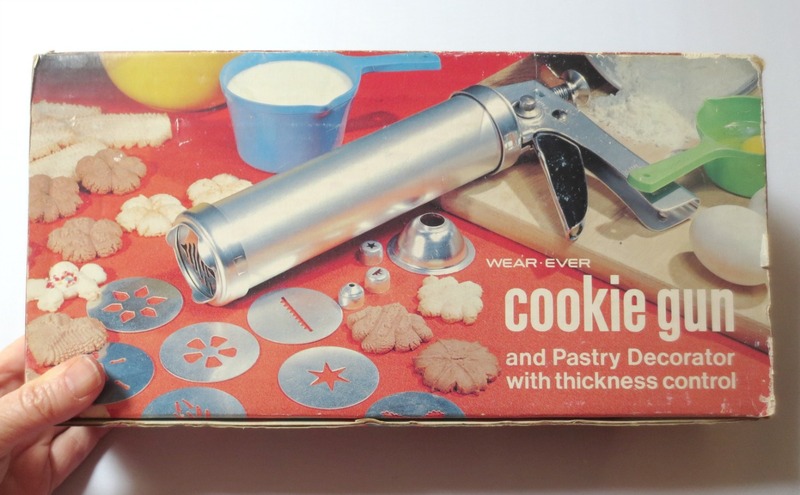 We had a cookie press like that growing up! !